Let me start by apologising to the Ronayne descendents whose ancestors come from outside of the small part of South Mayo/North Galway/East Roscommon which is covered by this micro-site. To get started, I concentrated on South Mayo, where my mother's ancestors came from. However, if this information proves useful to others, I will consider expanding it to the east and west to include the Glenamaddy and Ballinrobe areas. My initial intent was to get an overall picture of the scraps of information that I tend to collect when researching family history. I wanted some way of tying them together, and because they do not necessarily belong to the same family tree, a map seemed like the best way forward. Although some of the information is not relevant to my branch of the family, I felt that I should share it with others rather than just discard it. Sometimes, being able to rule something out can help to focus a search. 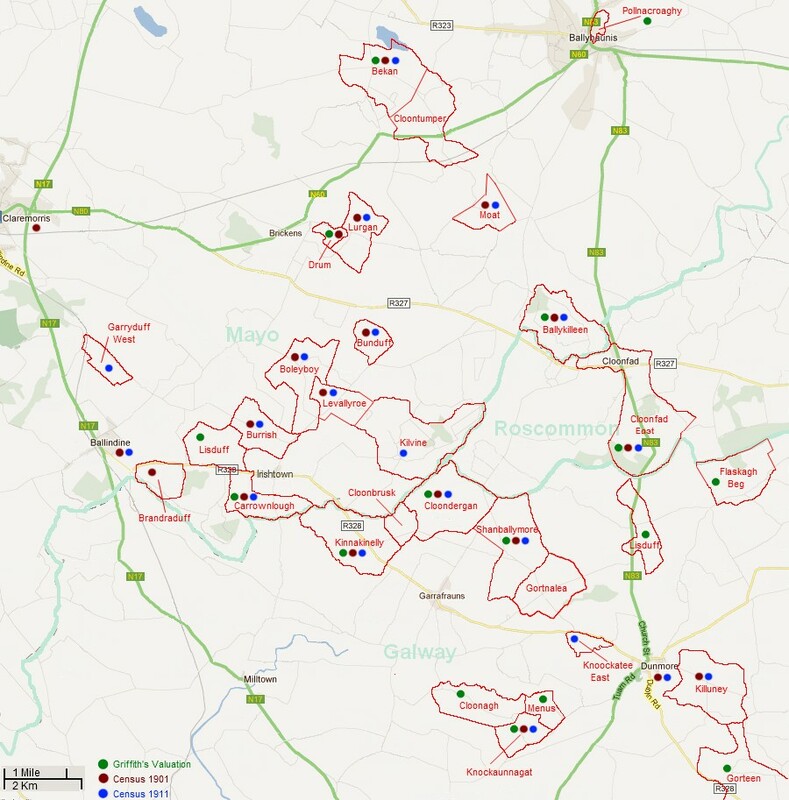 For many people, the proximity of the various townlands in which you will find Ronaynes is not that obvious. In the map below, the townlands in which Ronaynes lived are mostly contained in an area which is about 10 miles in diameter. The other thing that the map should make obvious is that the townlands are clustered on either side of the county boundaries. So, if your Ronayne ancestors came from Mayo, don't rule out any records that you find for Galway, and vice versa, because they may only be a few fields apart. The map has a key, at the bottom, which identifies whether a record was found in Griffith's Valuation, the 1901 Census, or the 1911 Census. Clicking on the townland will take you to a summary of the records found, where you can click on links to view the original census records and a list of relevant landholdings in the Griffith's Valuation. Some townlands may also have immigration records. To view a complete summary of immigration records, including records that cannot be matched with an individual/townland, Click Here. The spelling of Irish surnames varies considerably. Griffith's Valuation and the Census were completed in English but Irish was the day-to-day language. As the pronunciation of vowels is totally different in Irish and English, there was some confusion as to how names should be translated. So, families who were listed as Ronayne in one census were often listed as Ronan in the other census. In addition, the enumerators often filled out the forms and they spelt the names differently from one district to another. In some cases, the names were just spelt incorrectly, e.g. Royane. In gathering the information, I used the following variations: Ronayne; Ronan; Roonan; Roonane; Ronane; Roynane; Ronoyne; Ronagne; and Royane. However, there may be others that I missed. In attempting to match a family from the 1901 Census to the 1911 Census, you may be thrown off by the fact that the older members of the family are more than 10 years older in 1911 than they were in 1901. In some cases, they may be 20+ years older. There is a reason for this. The Old Age Pension was introduced in 1908 and, because there were no birth records for Catholics until the 1850's, or later, there was nothing to stop people from inflating their ages to qualify for the pension. And they did! Ages for children are a more reliable, though not foolproof, indicator of a match. Where there are a number of families in a specific townland, the summary of the Census returns indicates the number of the house. Usually, these differ between the two censuses. This is mostly due to the fact that the sequence in which the houses were visited was not the same in both years. It is also possible that some families moved to new housing which was provided by the Congested Districts Board. Almost all of the information on these pages is publicly available and, perhaps, I am "re-inventing the wheel". So, I would appreciate some feedback on whether you found it helpful. If people find it helpful, I will maintain the pages as more information becomes available and put a bit more effort into the layout and design. (Any information that people are willing to share is welcome and I will update the pages on request) Otherwise, I might just move on and concentrate on what is relevant to my branch of the Ronayne family. Obviously, if you have difficulty in accessing or viewing any of the information, I would appreciate it if you would let me know.